This article is about the food product. For the festive dinner, see Bean-feast. In Britain, Beanfeast is a vegetarian processed food made from soya. It is sold in dried form, in packets, to be mixed with water and boiled. The cooked product resembles mince. It is marketed in three varieties - Savoury Mince, Bolognese Style and Mexican Chilli. 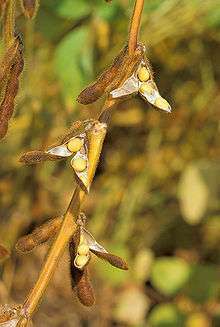 Beanfeast was the focus of protests against its manufacturer, Unilever, when it was found to contain genetically modified (GM) soya. The sales of the product dropped by 50%. After a meeting with Greenpeace in April 1999, Unilever agreed to remove GM ingredients.